Furtive was an offshoot of Simon Grigg and Paul Rose's Propeller Records, distributed by CBS Records and then, briefly, by Festival Records. The label was initially created to fulfil a verbal commitment made by The Newmatics to record for CBS, prior to their signing to the Propeller family in early 1981. It was thought easier to simply create a new label than explain to Festival that one act on the roster would be distributed via another company. It also seemed to offer the expanding indie setup a more flexible A&R policy than that required by Festival. However the first release for the label was not to be by the Auckland ska/soul band, but by Tall Dwarfs, the duo of Chris Knox and Alec Bathgate who were newly free from Toy Love and looking for an outlet. It was Knox who both named the label and hand-drew the distinctive label design and logo. The first release was the Tall Dwarfs’ Three Songs EP in August 1981, a record which both charted at No.25 and alerted the world to the impending Doug Hood/Chris Knox 4-track recording techniques that would soon dominate the early releases on Flying Nun. Two singles followed from The Newmatics, the double 7-inch Broadcast O.R. in (No.13 in October 1981) and ‘Square One’, released after the band had split in May 1982 (No.42). Famously the Broadcast O.R. EP cost more to package than it was sold for and was the subject of some heated arguments between the label's owners and CBS who wanted to issue the release in a plain white sleeve. Happily, sense prevailled, but it meant that Furtive never found a solid financial footing. 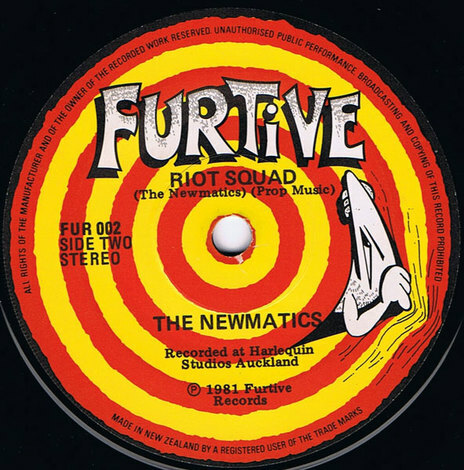 A four track 12-inch EP of four new artists signed to the label, The Furtive Four 3 Piece Pack, with songs from The Prime Movers, The Bongos, The Skeptics and The Dabs, was released to coincide with The Furtive Tour in June 1982. A 12-inch by The Skeptics, Pyrronhist Selection, was scheduled to follow later that year, however the tapes famously disappeared from the Propeller offices never to be seen again. In October 1982 Furtive released the Prime Movers’ 7-inch single ‘Crying Again’, by which time the label had moved distribution to Festival Records after management changes at CBS meant that the multi-national decided it no longer wanted to distribute local independent labels. 'Another Day', the second single from The Dabs, whose first 12-inch was on Propeller, was recorded and scheduled for early 1983 but remains unreleased. Propeller wound down Furtive in March 1983 to concentrate on the parent label and The Skeptics moved to Flying Nun.